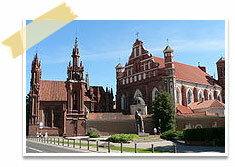 Car Rental Vilnius | Explore Vilnius with Low Priced Car Hire Service - Book Now! The capital and largest city of Lithuania, Vilnius lies on the bank of Neris River and is situated in southeastern Lithuania. Vilnius is an important economic centre of Lithuania and is home to one of the major financial centers of the Baltic States. This city has many universities and has great student population which offers the city a vibrant and lively atmosphere. This city is served by Vilnius International Airport which is the largest civil airport in Lithuania. The travelers arriving at the airport can rent a car with Lithuania Cars Rental and easily drive to their desired destinations. One of the most noticeable landmarks of Lithuania is Vilnius Cathedral. The splendid Vilnius Cathedral lies on the central square of the Old City. This beautiful cathedral has a vivacious history filled with fascinating artworks and traditional icons. Vilnius Cathedral has more than 40 paintings and frescoes out of which Casimir Chapel is the most magnificent one. Dating back to 13th century, Gediminas Castle is another major tourist destination. The travelers can enjoy a breathtaking view of the old city from the top of the majestic octagonal tower. This castle also has a museum which displays artifacts portraying the history of Lithuania and Vilnius. The travelers on a family vacation can spend pleasurable time at the European Park which exhibits fascinating outdoor sculpture exhibition, beautiful woods with natural springs and art work of artists from 27 different countries is displayed. The other must see attractions of this city include Museum of Genocide Victims aka KGB Museum, National Museum of Lithuania, St. Peter's and Paul's Church, Old Arsenal Building and Contemporary Art Center. Whether traveling alone or with family, Lithuania Cars Rental offers best car hire service at different Lithuania rental locations. Lithuania offers a fantastic range of cars which include small cars, big family cars, medium sized cars, sports cars and luxurious sedans, SUVs, etc. The travelers can choose the cars that suit their requirements and easily book them online.